To promote the values and practices of the Islamic Shia Ithna Asheri Faith for the spiritual well being of humanity at large. Registered Charity in the UK No. 273130. 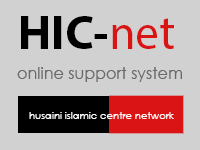 Click here to view the HIC calendar and click here to view the monthly planner.